Nearly every seat in Ballroom C was filled, and tickets were sold-out. 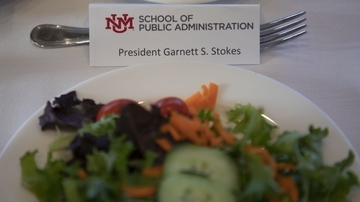 UNM President Garnett S. Stokes was the keynote speaker at this year's event. President Stokes took questions from the crowd following her keynote address. UNM President Garnett S. Stokes and SPA Director Bruce Perlman. 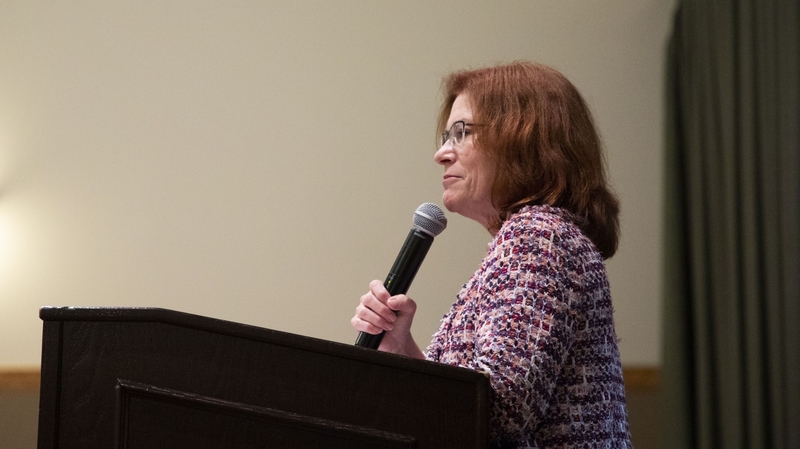 A sold-out crowd of UNM, city and state leaders filled SUB Ballroom C for the 16th annual Arthur A. Blumenfeld Endowed Lecture. 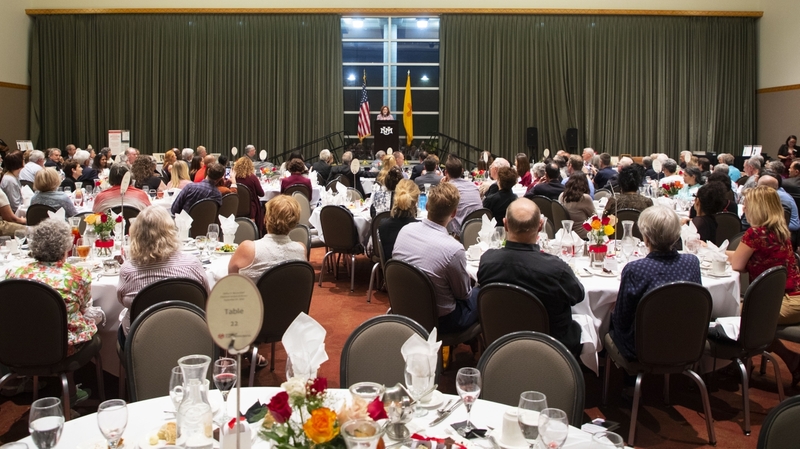 UNM President Garnett S. Stokes gave the keynote address Monday night, focusing on safeguarding the value of higher education. She spoke about the importance of attaining a college degree and challenged the crowd to not only tell the story of what academics do, but also why it’s of value. Stokes referenced a number of surveys supporting her message, including a 2017 Pew Research study which found only 55 percent of Americans say college has a “positive effect on the way things are going in this country.” Similarly, a Gallup poll showed a staggering 56 percent of Americans say they have “some or very little” confidence in colleges and universities. The national trends are mirrored in New Mexico, where a statewide image and perception study last year showed that only 35 percent of people agree a college degree is necessary for young people to succeed in the work place. Stokes suggested the cure to the dwindling perception of higher education could lie in changing the narrative. She asked the crowd to consider how to increase confidence in colleges and universities – through positive personal experiences, mentorship and alumni reputation. Many of those in the crowd were alumni of the UNM School of Public Administration (SPA). 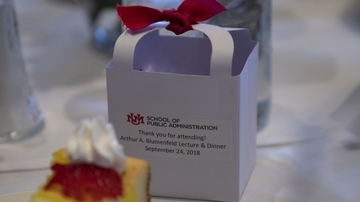 The RSVP-only guest list included former and current state leaders, the Bernalillo County District Attorney (and last year’s Blumenfeld Lectureship keynote speaker), several Albuquerque city officials and many of the SPA faculty. 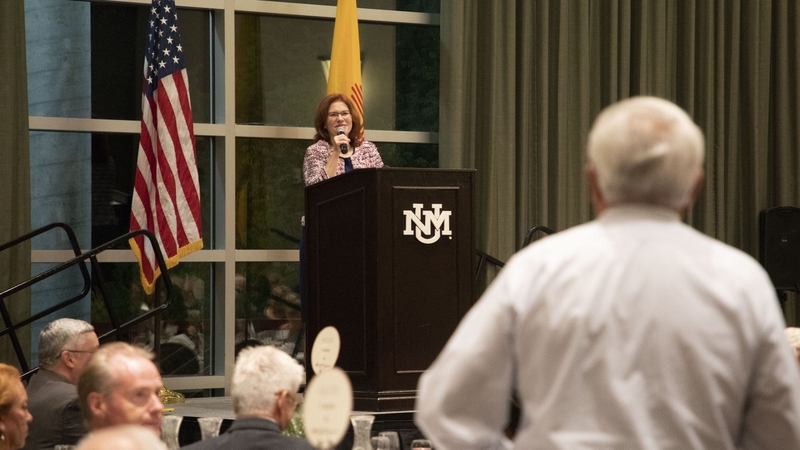 In addition, countless University of New Mexico deans, faculty and staff members were in attendance. 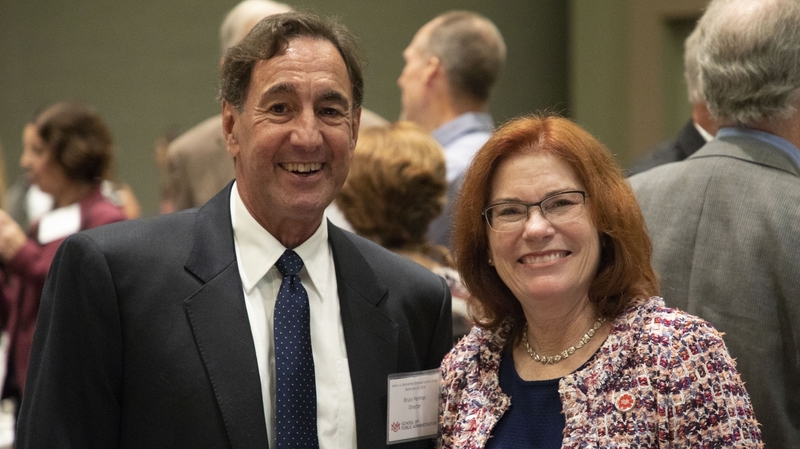 The Arthur A. Blumenfeld Endowed Lectureship honors the life and work of Arthur Blumenfeld, the former national president of the Government Finance Officers Association and former Chief Administrative Officer for the City of Albuquerque. The lectureship is intended to facilitate excellence in public administration and finance. Click here to read more about the Arthur A. Blumenfeld Endowed Lectureship, or to make a donation to the endowment.